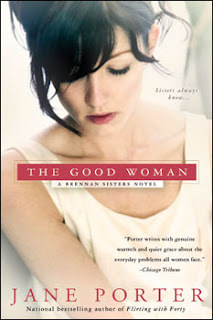 Today is like the first day of school for Jane Porter all over again, as she is celebrating the pub day for her latest novel, "The Good Woman" (reviewed here). We're thrilled to have her back at CLC on this very special day, as she is not only an amazing writer, but also kind and generous to all her fans. She's also had a big year with moving from Seattle to her new home in the greater L.A. area. Since September is here, we're doing a back to school theme for the month. Jane is helping us kick it off and I think you'll be able to relate to what she has to say, on some level or another. In addition to Penguin offering one copy of "The Good Woman" to a lucky reader in the US, Jane also has two surprise gifts to give away to a some lucky readers anywhere in the world! To learn more about Jane and why I'm such a fan (and I'm not the only one here either), visit her at her website and blog, as well as Facebook and Twitter. Sixth grade at Conyer with Mrs. Kearney. I only went to Conyer Elementary for one year and I was so very nerdy with my big thick glasses, stretchy pants, (my mom didn’t buy us jeans back then) and insatiable appetite for books. But Mrs. Kearney loved my writing and encouraged me which made me want to write even more. She also loved books and had reading contests throughout the year, and I won every single one. I shouldn’t brag, but since I was the last one always picked for PE teams I think its okay to share that I blew away the competition by reading a book a day....filled up the chart and another chart and then another chart with my little gold and red stars. And if that wasn’t enough, Mrs. Kearney even had the 6th grade class perform the play I wrote about the Bicentennial (1776-1976) and the entire school and all the parents came to watch. I got to help direct my own play and then I danced a solo midway, and thought all my dreams had finally come true. Until the cute boy I had the crush on came up to me back stage after my solo and asked me what that smell was. I sniffed myself and realized I smelled terrible. I was horrified. The cutest boy in my school finally noticed me....but only to point out I had BO! I’m a product of the 80’s, so I’d have to go with The Breakfast Club. First day of school. I loved school. I was a geeky book girl and school made me nervous but I loved that new feeling you got on the first day of school, and laying your new clothes out and being so excited about having a new teacher and maybe a new student in your class. Probably something I read in American Lit or British Lit. An Edith Wharton novel, most likely. But then, I loved anything in an English class, just because I knew it was my thing, and I could discuss books forever....probably very annoying to all but those who love discussing books and themes forever. I think I’m most proud of the year I spent as a foreign exchange student in South Africa with AFS. I went in the middle of my junior year of high school and returned in January of my senior year and it was so different from what all my friends were doing, and so hard, too. It was incredibly challenging and lonely and compelling as I started in a girls boarding school in Natal, and then bounced from family to family until I was placed with a young Afrikaaner couple in Krugersdorp, and spending so much time alone allowed me to read everything I could about South Africa and its history and literature, but it was almost too isolating. I don’t know that the year away was ‘good’ for me...but it definitely impacted my life, and changed me forever, so I am proud of that. Proud I stuck it out. Proud I tried to do something different while in high school. I danced in all the high school musicals, and did community theatre, and ballet, and swam and wrote. And wrote. And wrote. Opinion pieces for the local newspaper, articles for the school newspaper, plays for my class to perform, poems for Teen Magazine, and essays for contests. I’ve always thought of myself as a writer, even before I started making money at it. Did you go to any school dances? If so, which ones stand out the most? I did not go to many dances. I actually never went to any dances where a guy invites you. I usually had to wait for the Sadie Hawkins dance so I could ask someone to go, and even then, the guys would turn me down. I wasn’t popular and I liked the wrong guys, had a big thing for unrequited love (even asked the same guy two years in a row to the Sadie Hawkins and he said no both times...I’m a very slow learner...) so my senior year of high school, my older brother who was already in college, had his best friend come home from USC and take me to my senior prom so I could go. Thank you, brother Thom, and thank you Chuck Winn! Special thanks to Jane for a lovely interview and sharing treats with our readers and to Penguin for sharing "The Good Woman" with our readers. Jane is also giving away swag for anyone who buys "The Good Woman" between now and September 18th. Don't miss out! Please comment below with your e-mail address. (Please note: Entries without an e-mail address will NOT be counted. You can use AT and DOT to avoid spam. Or provide a link to your facebook page or blog if you can receive messages there.) If you live outside the US, please make note of that, as well. 1. Please tell us: What was your favorite year of school and why? Giveaway ends September 9th at midnight EST. My favorite year of school was not in high school at all. I had moved from the city to a suburban area and most of the people were in cliques. I didn't like how brand conscious they were and how much social status mattered to them. Those were painful years for me. My favorite year was my first year of extension in Indianapolis at I.U. No cliques and everyone mingled with everyone. The classes were small and the teachers were all Ph'd. One class only had five students. People cared for one another. I loved it. I follow Chick Lit Central with GFC. My favorite year was probably Junior year of high school - it is when I first remember feeling confident and not so wracked with self-consciousness! My favorite year was 1995, graduation. Chick lit follower (gfc-Christine A.
realized I forgot my email - ack! My favorite year of school was 11th grade. That was the year I finally started to discover who I was and stop caring about what people thought about me! 1. I think senior year of high school was my favorite year because it was so relaxing and everything was about the seniors. I love Jane Porter so much! My favorite year of high school was my senior year since I got my license and then a job where I made my own money. My senior year was my favorite. I couldn't wait to start college. It was probably my junior year in high school. It was my second year as a cheerleader and I was also the head cheerleader. Good times! I follow on Facebook, Twitter. I love Jane! My favorite year in school would have to be my Senior year in high school. I learned a lot about myself. 1. 3rd grade - everything after that was very hard for me. 2. I'm a GFC follower of the blog. 4. I'm a FB friend. My favorite year was senior year because I had classes I really enjoyed. I just started following with GFC. I loved college. In college my final year is my best. I traveled quite a bit, met lots of interesting people, and it was the first time I was really away from home and able to be my own person. I follow the blog (I get the e-mails daily). I have tweeted about the giveaway. Well I re-tweeted your tweet. Does that count? My favorite year was senior year in high school. I was a captain of the pom-pon squad, and we got to go to Dallas to perform at halftime of the Cotton Bowl. We had a blast! Senior year was my best year. The classes were all interesting, and we started thinking about colleges. Senior, because High School was over. follow on: fb, gfc, twitter, smoke signals and morris code. Favorite year of school was my freshman year! A lot happened that year! The eighth grade. I was living in a small town that year after moving out of Los Angeles and a horrible 7th grade experience. In 8th grade I went to a school with 4 room but we only used 3 since we only had 3 teachers. There were all of 72 student. I needed that to decompress from the previous year. Congrats on the book! I'd say senior year because it was the easiest and funnest. My final year was amazing. We were treated like adults. Senior year was my favorite year. I got to take all the classes I wanted to and gym wasn't one of them! My grade 8 year was awesome! I just had a great time making new friends and joined a rock band in my school with the hottest guys. My favorite year of school was my freshmen year of college, experiencing all new things and meeting friends who would stand next to me at my wedding. Aww, my mom didn't buy me jeans in elementary school either! She had a thing for girls in dresses. My favorite grade was probably 11th or 12th when I developed a sense of identity and self confidence. I went to school in Australia and my favorite was 6th grade. I had a really nice teacher. My favorite High School year was 11th grade hands down. I was one of the section Editors of our Yearbook and I began as one of the "Library Student Worker" which meant I read new books and magazines that I shelved! I was in heaven..me a book-a-holic!Fun year! Follower:RSS,Goodreads, Facebook CLC Member, Pinterest. I'm a FB member, GFC follower and Twitter follower! My fav year of high school was senior year. I was on the newspaper staff and loved writing about what all the other seniors were doing. My senior year... I had a cushy schedule and I as training to be a veterinary technician on school time! My favorite year of school was first grade. I was friends with almost everyone in the class, and we still had a lot of time to have fun. My favorite year was senior year. I think the anticipation of what was to come, as well as just spending the year having fun with friends made it an exciting time. Love Jane and her books. She is a great writer and so wonderful to her fans. As for me, my favorite year in school was my senior year in high school. I had such a great group of friends and we really lived it up that year and had fun.